?Probably the best course I have attended in years! The AOO™ approach has significantly impacted the way I address recession and GBR procedures. It has consolidated the way our interdisciplinary team addresses complex and comprehensive treatment planning. The orthodontist will see cases more biologically, and the periodontist will appreciate the mechanical aspects of orthodontic treatment. My advice, round up your favorite orthodontists and ?just do it? (the course)! You will never look back!? • Sorting through the misunderstandings of rapid tooth movement. Shedding the mechanical mind set of ?bony block? movement and replacing this with the physiologic interpretation of ?bone matrix transportation?. • Orthodontic versus orthopedic forces in de-crowding, expansive movements and space closing. 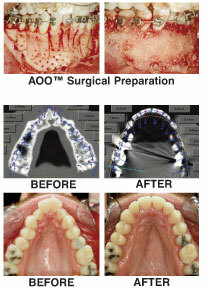 Modifying orthodontic adjustment scheduling to take full advantage of the ?window of opportunity?. This entry was posted by Dental Continuing Education on January 14, 2010 at 3:07 pm under Uncategorized. You can leave a response, or trackback from your own site. Follow any responses to this entry through the RSS 2.0 feed.